Is It Good? 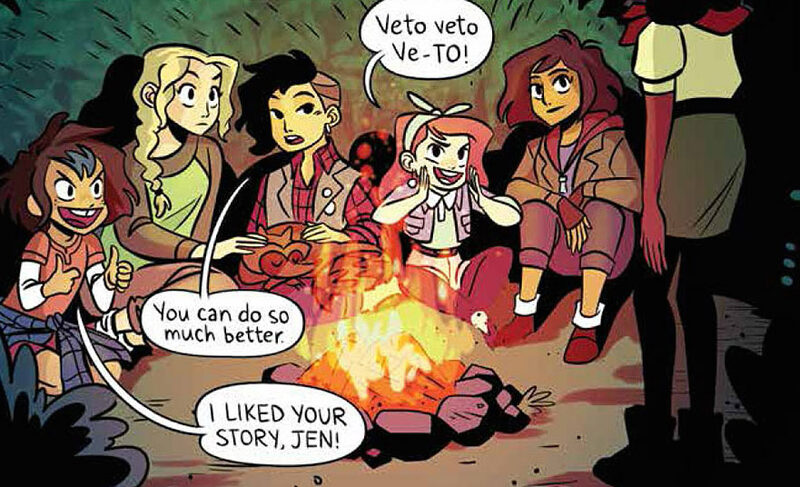 Lumberjanes #9 Review – AiPT! Fresh off the conclusion of their first story arc, the Lumberjanes scouts take a break from the strange shenanigans around camp by trying to achieve their badges in scary storytelling. Is it good? Lumberjanes was originally planned as an eight part series, but with popularity right out of the gate, it was expanded into an ongoing series. In the last issue, the Scouts wrapped up their first arc, with the girls outwitting Greek twin gods Artemis and Apollo to rescue Jo and the boys from the neighboring camp. We’re still left with the mystery of why the camp is a hotbed of supernatural activity, but this issue is a bit of a breather before the next story arc begins. Each of the girls tells a scary story to earn their next merit badge with a twist—each girl’s story is illustrated by a different artist, all new to the Lumberjanes universe. The writing in this issue is top-notch as per usual, with some especially good puns (a bonus for me – “If You’ve Got it, Haunt It” is the perfect name for a ghost story badge). The girls tell their stories not only in their own voice, but the story tries to fit their personality or reveals something about them. I really enjoyed the recurring joke of Jen being unable to tell a scary story, though Ripley’s revealing her fear of being alone felt a little heavy-handed. Mal’s story worked the most successfully, both as a scary story and fitting with her more cautious approach to the world. However, this concept didn’t work for every story. I noticed this the most with “Taily Po” and “Old Betty” – both felt like standard ghost stories without enough of the girls’ personality to show why Molly and April chose them. But they were still very entertaining ghost stories, so it’s a minor complaint. Having the art styles change as each new story began was a great idea in theory. However, not all of the artists’ style fit the story they illustrated. T. Zysk’s art for April’s story particularly stuck out to me – it went much further into horror and felt like it crossed into true scary from the fun scary tone that the rest of the issue (and Lumberjanes generally) has going on. What I love about Lumberjanes is how much it feels like a great teen novel, in a completely natural way. The use of silly replacements for swearing, the energy and excitement of the girls, and especially the ongoing theme of friendship as the most important way to solve problems (while winking at that very notion) follows the best in teen and middle grade media. While this issue is mostly an independent story, it still gives us more of the girls and traditional camp activities, with the bonus hint of what the next arc might be. I’m hoping for some Native American influences in the next arc. A bear turning into an old lady? What the junk!